Lois J. 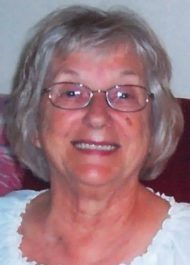 “Sue” Coxey, 82, of Lititz, passed away Tuesday, March 19, 2019 at Brethren Village Retirement Community after a full and fruitful life. Born in Quarryville, PA she was the daughter of the late David L. and Mary L. (Zimmerman) Graybill. She was the loving wife of the late Richard M. “Mike” Coxey who passed away in 2012. Sue’s first love was homemaking and family. She was a former supervisor of the former Colebrook Terry in Leola and Sechan Electronics, Inc., in Lititz. She was a resident at Brethren Village for the past 8 years, where she loved volunteering in the gardens and at the Thrift Shop. She is survived by her two sons, David Stoltzfus husband of Rev. Patty Stoltzfus of Exton, Joe Stoltzfus husband of Vicki of Ephrata; two grandchildren, Jill (Stoltzfus) Sbarbaro wife of Jim, Jon David Stoltzfus partner of Shannen Hofheimer; beloved great-granddaughter, Samantha Joy Sbarbaro; her brothers, James Graybill of Nickel Mines, PA, and Curtis Graybill husband of Betty of New Holland; two sisters, Ella Mae Graybill Mosebach of Lancaster and Sharon Graybill Silimperi wife of Victor of Nazareth, PA; and many loved nieces and nephews, who affectionately referred to her as “Aunt Bill”. She was preceded in death by her two sisters, Mary Rodgers and Betty Gossert; and brother, Jim Graybill husband of Janet. A Memorial Service will be held at 3:30pm on Sunday, March 24, 2019 at the Charles F. Snyder Jr. Funeral Home & Crematory, 3110 Lititz Pike, Lititz, PA 17543. Interment will be private in Quarryville Cemetery. Family and friends will be received from 2:30-3:30pm before the service. All are invited to a time of refreshment and fellowship at Brethren Village Fieldcrest Room directly following the service. In lieu of flowers, contributions in Lois’s memory may be made to the National Foundation for Cancer Research, 5515 Security Ln #1105, Rockville, MD 20852 www.nfcr.org. We will forever remember all the good times we had with you and Mike and the impact you had on our lives. We miss you both.